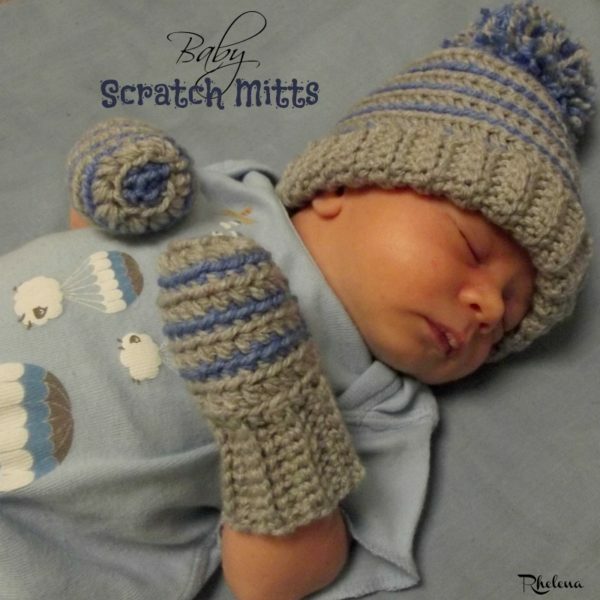 These crochet baby scratch mitts are not only the perfect way to keep your little ones from scratching up their newborn faces, but they are also nice and cozy for going outside in the cold. This pattern was designed to go with this pom pom beanie. I designed these to prevent the little guy from scratching up his adorable face. These are designed to fit a newborn. If you’d need something a bit bigger, you might like these baby mittens for a 3-6-month-old. Finished Size: Laying flat it measures 2.5″ across the body and 4″ top to bottom. Rows 2-16: Ch 1, blsc in each st across. Turn. (8 sts) Continue with this row until you have reached a desired circumference. Rnd 1: Continue with CA, ch 1, sc 20 sts evenly around; join with sl st to first sc. (20 sts) Do Not Turn, but begin working in rnds. Rnds 4-7: Rep Rnds 2 and 3. Rnd 9: With CB, ch 1, blsc2tog around; join with sl st in first blsc2tog. [5 sts] Fasten Off. Fasten Off CB leaving a 10″ tail for weaving in through Rnd 9 and closing off the mitt. 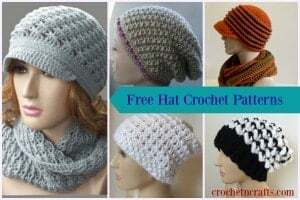 Check out more Free Baby Crochet Patterns on CPB.